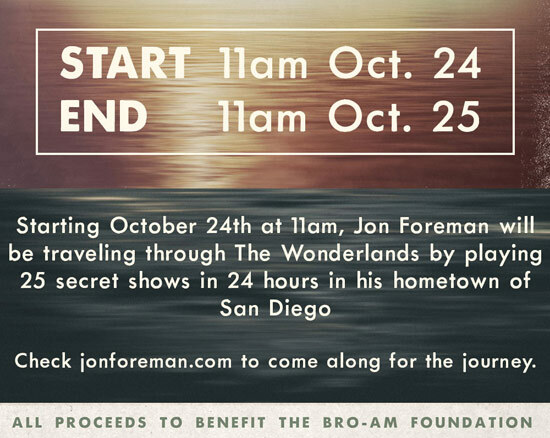 JFH News: Jon Foreman Announces "25 Shows In 24 Hours"
JON FOREMAN ANNOUNCES "25 SHOWS IN 24 HOURS"
LOS ANGELES, CA - September 28, 2015 - Beginning on Saturday, October 24th, Jon Foreman will play a series of 25 pop-up shows - all within a 24-hour period. The kick-off concert will begin at noon at Bro-Am Studios, a non profit performance space founded by SWITCHFOOT. Foreman's "25 Shows In 24 Hours" performances will all be in the San Diego area. Jon will also be joined on this excursion by some of his favorite musicians. With cameras rolling, Jon will be popping in and out of taco shops, his favorite rock clubs, his high school alma mater and many other locations. While some performances will be private - including a wedding and a show for patients at Rady's Children's Hospital - tickets/VIP packages for many appearances will be available to the public. All proceeds generated from "25 Shows in 24 Hours" will benefit The Bro-Am Foundation. All within the confines of the clock. "The last line of the last song says it best: 'I want to sing before my time runs out.'" Tickets and VIP packages for "25 Shows In 24 Hours" are available HERE. The 24-hour theme was inspired by Foreman's latest solo release, The Wonderlands (lowercasepeople records). The collection features a song for each hour of the day, broken down into four EPs that feature Foreman's collaborations with 24 different co-producers, plus an extra track. The first three EPs - Sunlight, Shadows and Darkness - are available now at http://smarturl.it/WonderlandsStore. There fans can also pre-order Dawn, the final EP in the series, and a box set containing all four EPs - scheduled for release on October 23 - plus limited quantities of highly unique pre-order bundles - including an opportunity to surf on the beaches of San Diego with Jon. "Your Love is Enough," from The Wonderlands: Shadows, is a Top 20 hit at CCM Hot AC/CHR radio. It can be streamed HERE. To date, cumulative Spotify streams for The Wonderlands are nearly five million, including two million streams of "Caroline," from The Wonderlands: Sunlight. Three songs have reached the US and Global Viral 50 playlists, making them among the most shared songs in the world on Spotify: "Caroline," "Your Love is Enough" and "June & Johnny (featuring Sara Watkins"). Stream The Wonderlands on Spotify HERE.